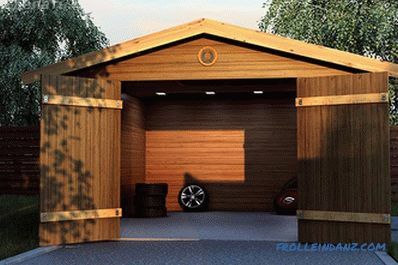 Garage made of wood in many regions of our country is the best option for construction, due to the affordable cost of materials, ease of installation and beautiful appearance of the finished structure. In this article we will explain how to make a wooden garage with your own hands, what materials to build it, and also show diagrams, photos and video instructions. The main thing is to choose the optimal construction technology and perform all the steps in exact accordance with the chosen type of construction. 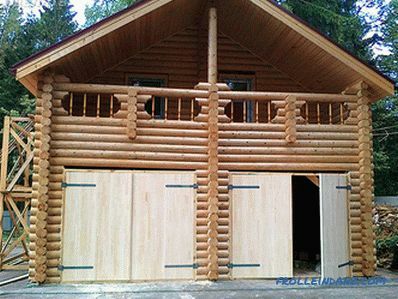 The two most common technologies for the construction of wooden garages are: frame technology and rounded logs. 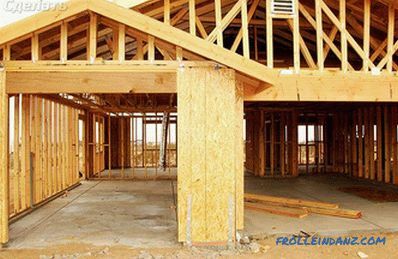 It is necessary to give preference to the construction of a box for a machine according to log technology, if the main building, house or cottage is built of similar material. 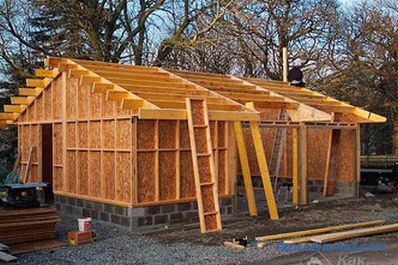 The frame construction will be cheaper, it is easier to pick up materials, and the time for construction will be significantly reduced. 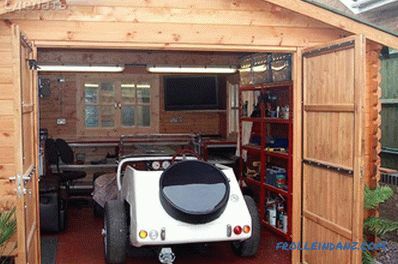 In addition, a wooden frame garage can be finished on the outside with any facade materials that fit the style of a country house immediately after the building is erected or after a certain period of time. Maximum speed and ease of work are the main ones advantages of frame technology. 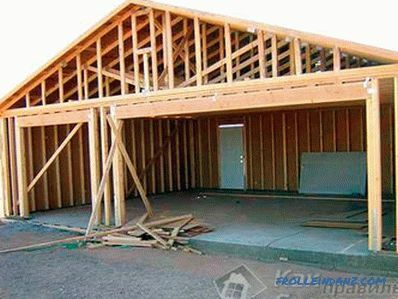 But, despite the simplicity, the construction of a frame garage requires preliminary preparation, development of the project, with the help of which it will be possible to calculate the required amount of materials and components. The project is calculated independently, with the assistance of experienced professionals or downloaded from specialized Internet resources. 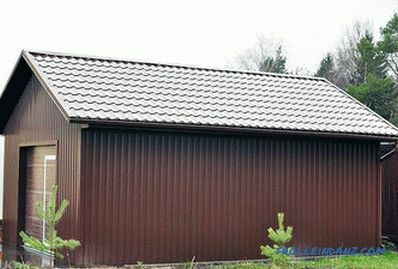 The size of the building should take into account the number of cars, the presence of an open carport for summer storage of cars and the attic floor, which many motorists arrange over the garage. 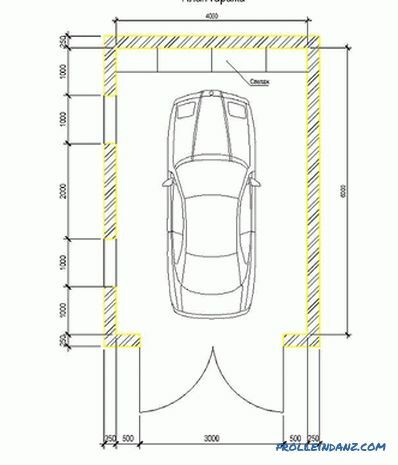 At the preparatory stage, the location of the future garage and the type of structure are set: separate, attached to the main task, the type of gate opening and combination with the common entrance area to the site. The selected site is thoroughly cleaned, leveled and, if necessary, rammed. Scheme A quality and reliable foundation is the foundation of any structure. The choice of technology for the construction of the foundation depends on many different factors: the structural design of the structure, soil features, financial capabilities of the owner, etc. Basically, the foundation is a concrete slab filled with monolithic technology. 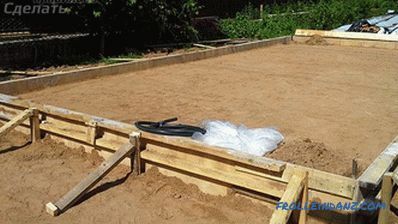 The concrete slab will serve as a subfloor, which can then be revetted with any finishing materials. 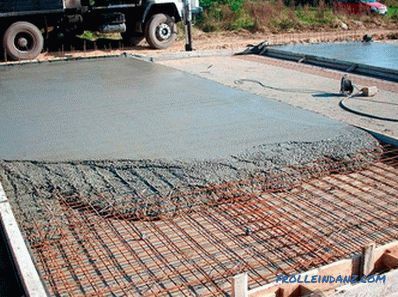 Being a kind of "floating" foundation, the concrete slab perceives evenly high loads, helping to avoid deformation of the structure during its operation. 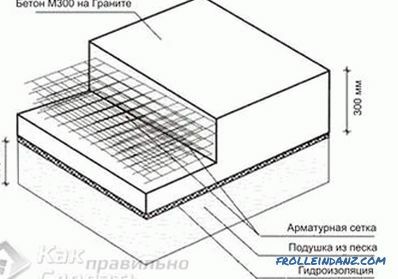 For the arrangement of a monolithic foundation around the perimeter of the planned development, a shallow trench is dug and a formwork is installed. First, make a pillow of sand and gravel, tamped it. Then they reinforce the base with two grids of metal rods, preparing the site, and fill it with concrete. After this, the foundation must be allowed to stand for about 3 weeks. 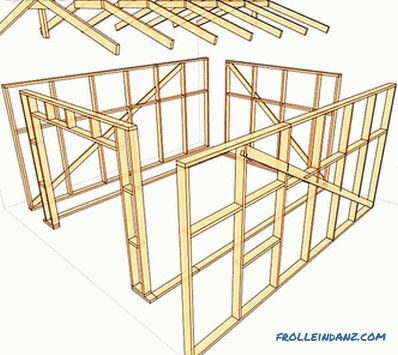 To give the frame greater strength in the corners of the building should be installed struts. 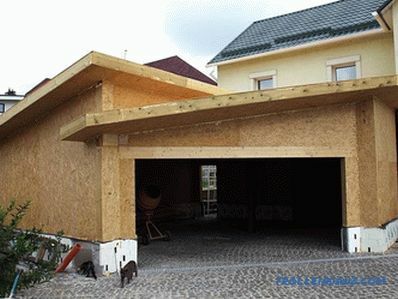 If the width of the garage is planned to be over 4 meters, it is better to make the ceiling beams using a more durable and reliable board of 50x100 mm. 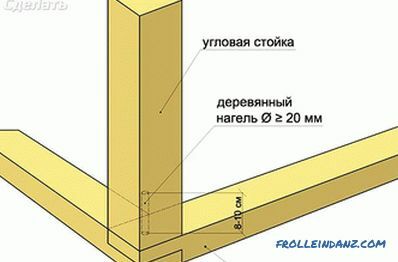 The longitudinal elements are made of timber at least 50x50 mm. 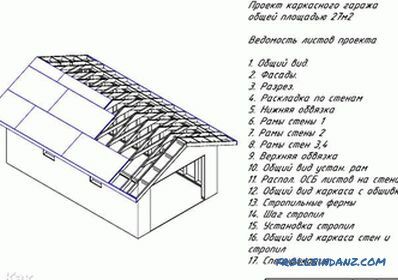 Board 100x25 is used for the arrangement of the roof mm, which is sheathed pre-selected roofing material. 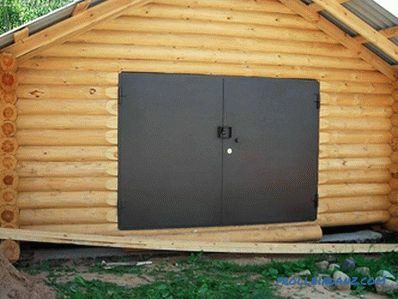 Metal tile or slate can be mounted directly on a wooden crate, not forgetting to equip the system of hydro- and vapor barrier in order to organize a comfortable microclimate in the garage. 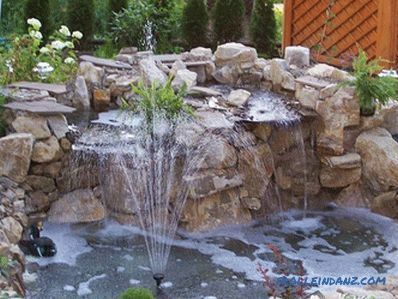 Outside of the roofing system, it is imperative to install a weir, which can be independently made of a plastic pipe cut in two. For cladding outside the building, you can use a special facade clapboard or a solid wooden plank, pre-treated with impregnation to protect against moisture. The inside of the garage is insulated with mineral wool, must be laid with a vapor barrier and sewn with clapboard. 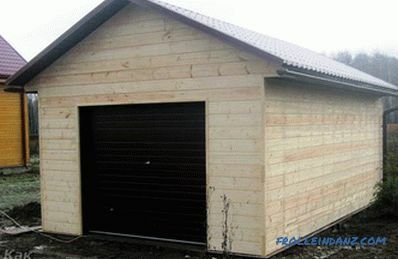 We suggest you to familiarize yourself with the principle of building a garage, the size of which is 6 * 4 m with a ceiling height of 3 m. A gate will be installed in it, 2.8 * 2.5 m in size, the foundation is made of reinforced concrete slabs, and the frame is made of wooden bars 100 * 100 mm. 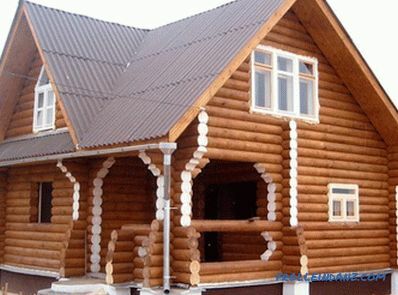 As for the exterior, it will be made of corrugated or other similar material. The first thing to do is clean the construction site. At the site of the future construction you shoot the ground up to 10 cm in depth. The bottom of the pit is covered with sand, leveled and rammed. 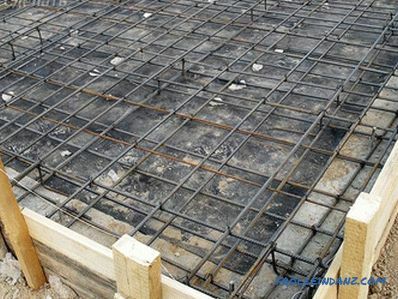 Lay the boards for formwork 1.5 * 0.5 cm and 15 cm in height along the perimeter. The base is reinforced with Ø 12 mm wire. The cells must be made 20 * 20 cm. The resulting mesh should be in the middle of the formwork. After that, concrete is poured. 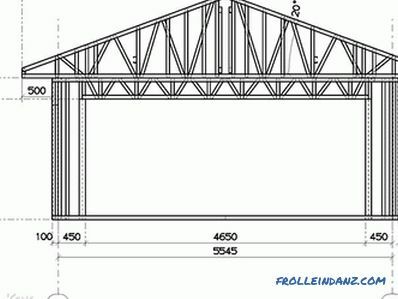 Although it may seem that such a foundation is unreliable, it is important not to forget that the weight of the frame construction of a garage of 6 * 4 m is relatively small. 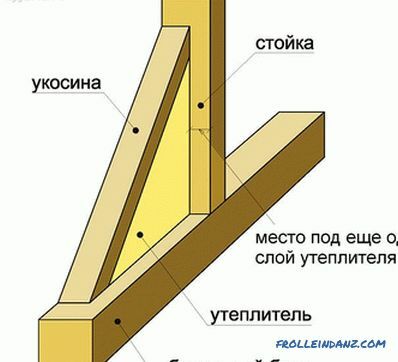 The principle of the construction of the frame is already described in this article. 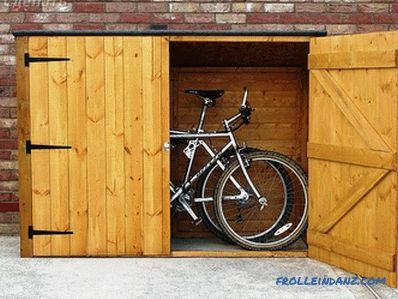 Here the difference lies in the fact that it is important to respect the size of the garage. Thus, a framework is erected from bars with a length of 3 m. Assembly begins with the lower crown. 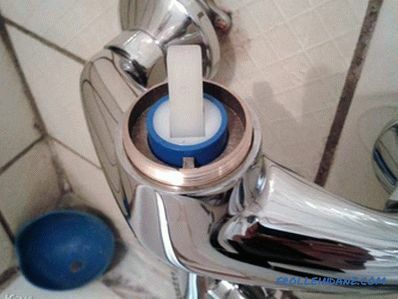 On it fix the corner drains and already on them the upper crown. 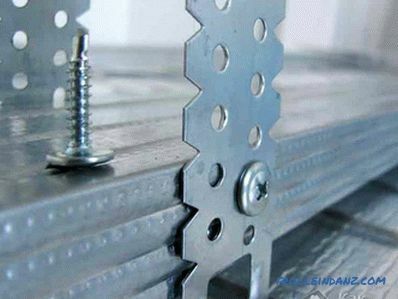 In order for the racks to have a reliable fixation, they should be temporarily fixed using rails or planks. The resulting structure will have a sufficiently large strength. If necessary, the frame is strengthened by jumpers for greater rigidity. As for the opening, the beam is laid horizontally on top of the posts. It must also be securely fastened. 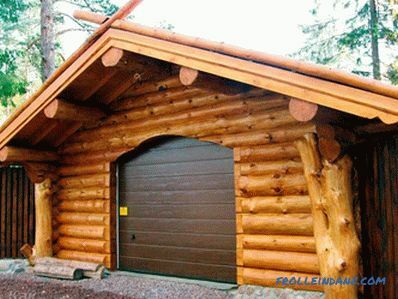 In our case, we will build a garage gable roof. 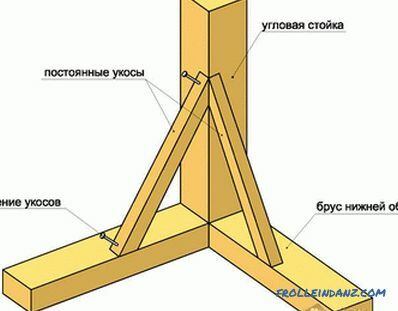 The ridge beam will be attached to two supports, the cross section of which is 10 * 10 cm. These supports will be supported on the gables. 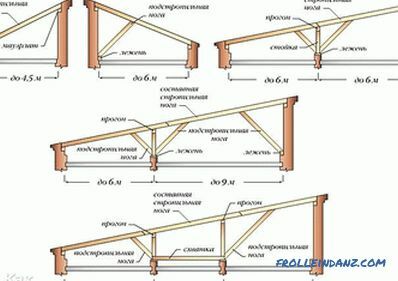 For the manufacture of rafters and ridge used board 40 * 100 mm. Rafters are installed close to each other. This will allow with a strong wind load on the roof to remain stable. Between themselves, they are tightened by puffs. Such technology will unload the ridge. The boards themselves should not be overlapped with a bolt, but under the ridge on top of puffs. Finally, the construction is sheathed with USB or plywood. 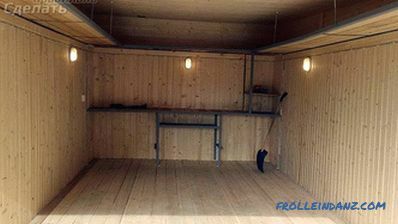 The floor in the garage can be made using different technologies. 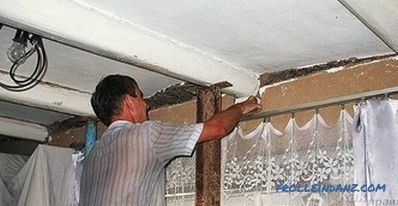 For example, you can make it wooden, concrete or use self-leveling floor technology. Walls can be treated with construction paper, and a hardboard is attached on top of it. But you can apply other finishing materials. As mentioned at the beginning of this description, outside we suggest installing decking on the facade. To do this, you must perform a small crate from a bar 40 * 40 mm. The ceiling can be hemmed with wooden boards. 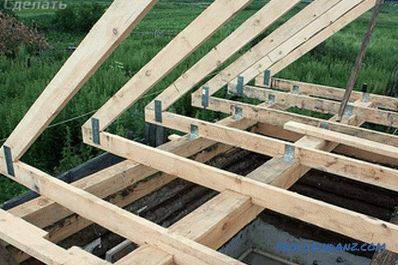 To keep the roof under the weight of snow not sagging, it is recommended to fix the fillets to the rafters from the side of the walls. 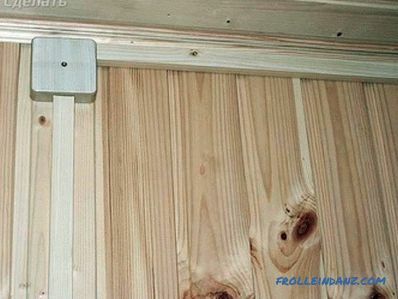 Also, this will allow you to make the filing of the eaves and roof overhang more attractive. 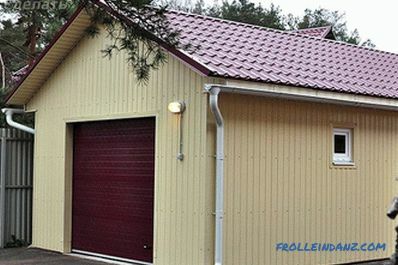 It is better to use 3 m sheets for wall cladding. Thus, the structure will be airtight without unnecessary joints. In conclusion, it remains to make metal gates. 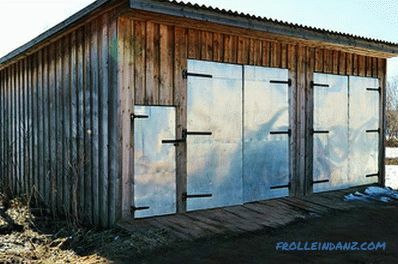 For more information on how to make a gate for a garage, you can read here - “Making a garage door”. 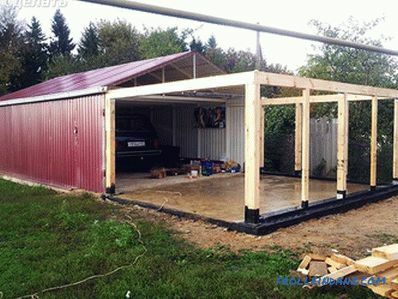 By following this simple technology, you can make a garage out of wood, measuring 6 * 4 m.